It is difficult to review Mother! without giving anything away or spoiling the experience. It is an experience that people will either love and get on-board with or completely reject and hate. It doesn’t feel like there could be any in-between. That is because it is an unforgiving film, that doesn’t stop to let the audience process what is happening or hold their hand and explain the details. That doesn’t mean it is confusing, it isn’t and the events that occur are quite straight-forward, but there are times that you will be watching, dumbfounded at what is happening and why. That is because the actions of some of the characters are so weird. 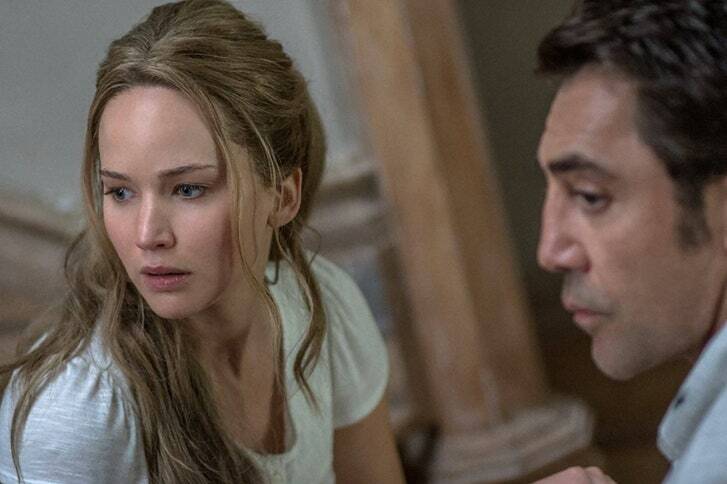 The first act sees Ed Harris show up to the idyllic home of married couple Javier Bardem and Jennifer Lawrence. He proceeds to stay and even move in, without any real reason or justification. His wife, Michelle Pfeiffer shows-up and proceeds to disrupt and cause chaos for Lawrence while Bardem seems strangely fine with this weird arrangement. That is as far as I can go. Anything more and it is saying too much about a movie which is best interpreted by each individual viewer. Some will see this as a straight thriller, as Lawrence’s life seemingly begins to unravel around her while others will look for deeper meaning and start to un-pick some of the symbolism that is hidden in plain-sight here. Both ways of watching will still leave the viewer exasperated as events begin to spiral out -of-control. The second act and then into the third becomes organised chaos and this is where the film will lose many people. The events don’t make any logical sense and in some cases seem disconnected from what happens in the first half of the film. What you can’t fault is the presentation. The film is orchestrated and put-together amazingly. Director and Writer Darren Aronofsky throws everything at the screen, from ultra-violence, religious imagery, sexual scenes and one moment involving a new-born baby which is uncomfortable to watch and will perhaps force many to turn off the film. This goes for double once you realise what the film is really about. For some it will be obvious from the beginning but for most viewers (me included) it will take a while before the penny-drops. There is a theme running through the movie and characters represent much more than you see on the surface. For some, this realisation will only add to their enjoyment of the movie while others will make the link and hate it. What it will do is tempt people to go back and watch this movie from the beginning again, to see where the links and the allegorical symbols really are. 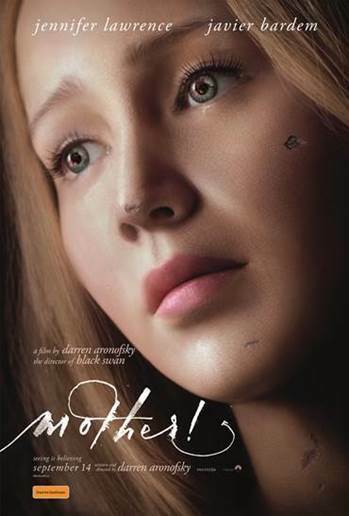 Overall, Mother isn’t necessarily controversial in a movie as itself but there is a deep message which will polarise people. It is a film of two halves and the first will frustrate while the second may completely baffle. Once the pieces of the jigsaw fit into place though, it becomes a completely different and very clever film. I loved the movie although I didn’t pick up on the symbolism at first, but once that clicked it all made sense and it had me hooked. A movie which really makes you feel a lot and there are many movies which aren’t able to do that. Exactly! I was slightly baffled by it all for most of the watching until my wife made a comment which made it all click and then you want to go back to the beginning and see what you’ve missed. Next Next post: Best of 2017: The final publicly voted list!